A team from Whitland Male Choir completed their epic cycling challenge in aid of Prostate Cymru on Friday 18th May. 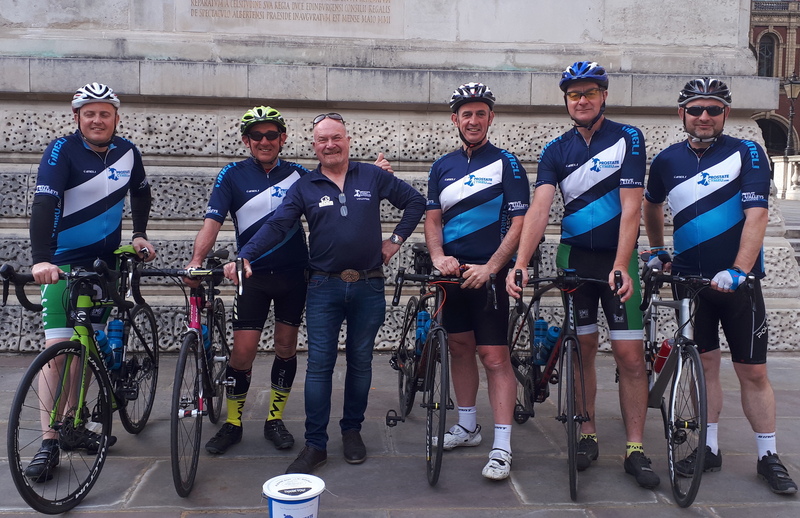 The group arrived at the Royal Albert Hall on Friday 18th May where Prostate Cymru’s Head of Awareness Dai John welcomed them. The Whitland choristers started their big challenge in Wales, cycling around the country to visit every choir that was taking part in the Festival of Massed Choirs concert at the Royal Albert Hall before heading to London to arrive in time for the concert (Saturday 19th May). The team aimed to raise £3000 for Prostate Cymru, the nominated charity of the Welsh Association of Male Choirs who were the organisers of the grand concert in the Royal Albert Hall. The enthusiastic team generously supported by the several choirs taking part in the concert surpassed their target raising an incredible £7500 for the leading prostate health charity in Wales.